The final day of Canada’s Coolest School Trip brought with it a return to city life as Mrs. Henderson’s Grade 8 class rolled up their tents and prepared to leave Beveridges campsite for Ottawa, the nation’s capital. The students were met at the Centennial Flame in front of Parliament Hill by Parks Canada’s Youth Ambassadors Joe McLeod and Sahej Kaur. McLeod brought a guitar and rallied the students around him with a game of circle tag to get their blood flowing after a long bus ride. He then led them in a sing-along about their experience touring Parks Canada sites across Ontario. 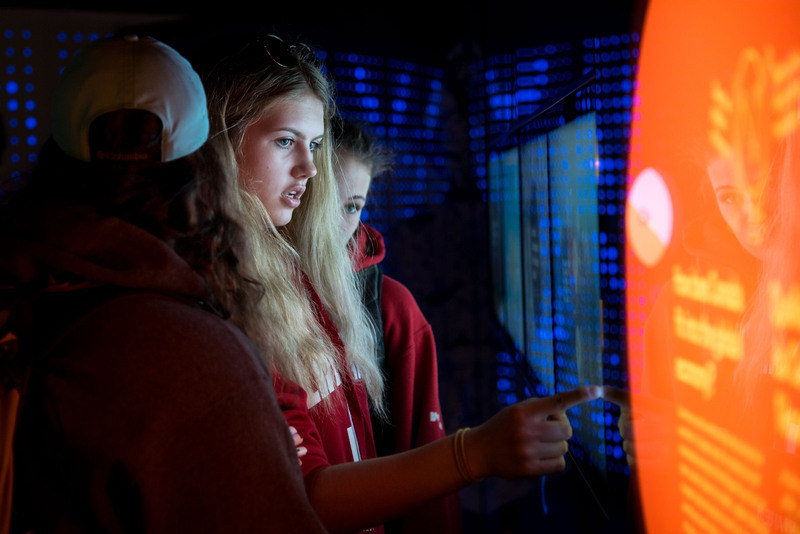 Students then had the opportunity to visit the Bank of Canada Museum, which features hands-on exhibits about the economy, as well as a collection of artefacts, such as the five-dollar bill that was taken into orbit by astronaut Chris Hadfield. The students flocked to the different games in the museum and in the process learned about things like supply and demand, currencies from around the world, and their own spending habits and place in the economy. Some of the students were surprised by how much they spent on sports and books and how the spending habits of Albertans differ from people in other provinces. “It’s cool. I really like the museum, it’s so interactive,” said Kalli Reid. After stocking up on souvenirs in the gift shop, the students returned to Parliament Hill for lunch and had a picnic on the front lawn. As they chatted in between bites of their sandwiches, the bells of the Peace Tower chimed noon overhead. Once lunch wrapped up, Kaur led the students on a walking tour around Parliament Hill, pointing out important monuments and sharing fun facts. She talked about the 1916 fire that destroyed most of the original Parliament buildings (only the library survived) and how some quick-thinking staff saved the portrait of Queen Victoria by cutting it out of its frame. Kaur also brought the class’ attention to the roofs and explained how the architects had used horse urine to make the copper oxidize faster to achieve the roof's signature green colour. At the monument to the Famous Five, which commemorates the “Persons Case” that was the precursor to women obtaining the right to vote in Canada, Kaur quizzed the students about women’s rights today and whether they still faced any issues of equality. The tour ended at the Rideau Canal locks overlooking the Ottawa River. From there, the students were let loose for some free time and much-requested shopping in the downtown area of ByWard Market, which is known for its colourful souvenir stalls and specialty stores. For dinner, the class ate at The Grand Pizzeria and Bar, where they devoured thin-crust pizzas and heaping bowls of spaghetti and meatballs. 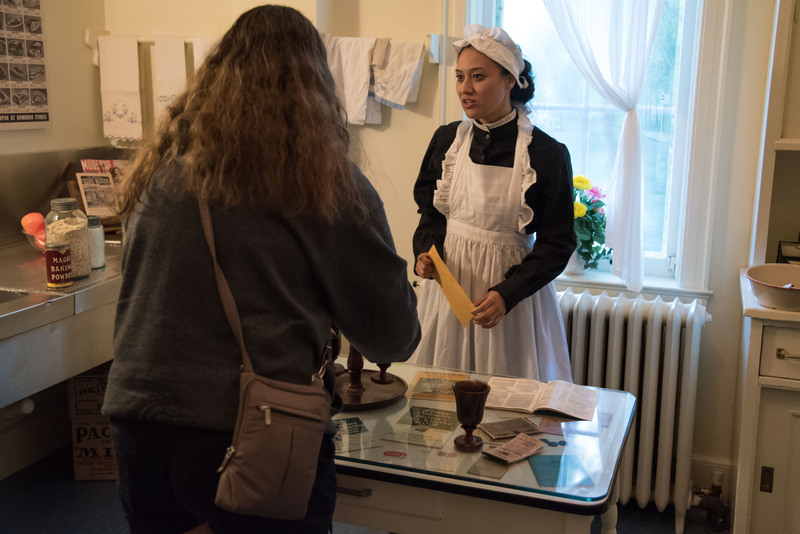 But the evening didn’t end there, and soon the students piled onto the bus for their final stop: Laurier House National Historic Site. This Victorian-era mansion was once the home of two of Canada’s prime ministers, Sir Wilfrid Laurier and William Lyon Mackenzie King. The students sat down to watch a film about the history and achievements of the mansion’s former occupants. As the end credits rolled, a man dressed in an old-fashioned suit walked into the room. He explained to the students that they were about to travel back in time to the middle of the Second World War, where they would meet some interesting characters in need of their help. Amid giggles and excited chatter, the students met Mackenzie King (played by Rick Cousins), King’s medium (played by Caroline Bowden), and King’s military advisor (played by Mike Kosowan). The rest of the evening was filled with drama and intrigue as the students ran around the mansion, looking for clues to missing items and solving coded riddles and messages. The grand finale included a séance, much like the ones that King was said to have held during his time as prime minister. 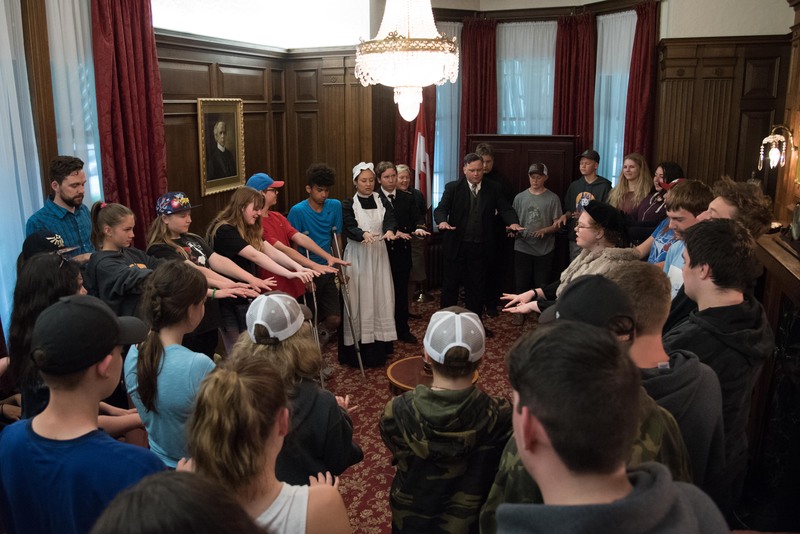 Whether it was from the excitement of the evening or from the atmospheric mood of the old house, the experience left an impression on several of the students. Students were given free reign to explore the house and refreshments were served. As the evening wound down, Adele Henderson, the students’ teacher, had a few parting words for Parks Canada and her class. Catch up on all the highlights from Canada’s Coolest School Trip!